Think lovely thoughts and they will lift you up in the air! 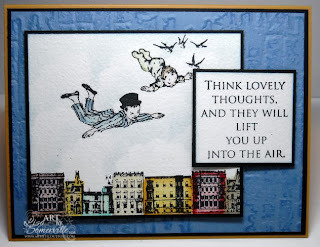 Perfect sentiment to go along with these wonderful images from the newly released Neverland plate from Artistic Outpost, don't you think! When my 15YO was about 2, he just LOVED "Peter Man" as he called him. He'd watch that movie over and over. My DH use to tease him and say "you're Wendy", he'd so "no, I'm Peter Man, you're Wendy". The images are stamped in Black Archival, then colored using the Marker Watercoloring Technique. I did stamp the buildings twice to extend across my panel. I added "faux clouds" using Blue ink, a sponge dauber and a Scallop punch. The background is embossed with a Texture Fades Folder. Love this card, it reminds me of looking at the pictures in old books sitting on my grandpa's lap. Very nostalgic and sweet. Very inspiring card! I loved Peter Pan too :-) Great job on the clouds. Very nice card. I love those buildings! Thank you for your help. Now I will know where to look. I really love how you made this card. The little touches like the clouds and coloring the buildings made a big difference. Great card Lisa. I love the treatment of the buildings and your sky is wonderful. Love the soft coloring it does remind you of an illustration in an old book. Gorgeous card! Peter Man.. Too Cute!